1. Preheat oven to 325°. Cut lemon into quarters. In small bowl, combine 2 tablespoons salt, pepper, oregano and basil. 2. Remove neck, giblets and liver from turkey. Place neck and giblets in large roasting pan; discard liver. Place carrots, celery and onions in roasting pan. Sprinkle 2 tablespoons salt mixture inside turkey cavity and sprinkle remaining salt mixture over outside of turkey. Place garlic, marjoram, thyme, rosemary and lemon inside cavity. 3. To truss turkey, cut 4-foot length of kitchen twine. With legs facing away, center twine under legs of turkey. Wrap twine around legs, criss-crossing ends; pull twine tightly to secure legs. Run twine the length of turkey, securing wing tips. Tie ends of twine together over neck skin. Cut off excess twine. Place turkey, breast side up, in roasting pan on top of neck, giblets and vegetables. 4. Roast turkey 3 to 3-1/2 hours or until thermometer inserted into thickest part of thigh reads 165°, rotating turkey halfway through roasting time. Tent turkey with aluminum foil if turkey is browning too quickly. Place turkey on large platter; cover with foil to keep warm. (Internal temperature will rise 5 to 10° upon standing.) Remove kitchen twine. 5. 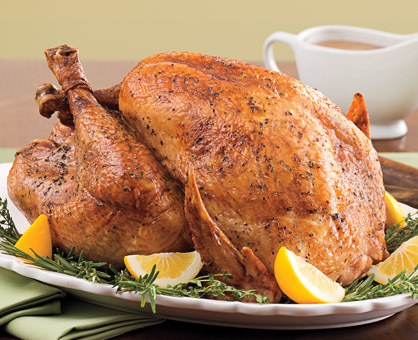 While turkey rests, prepare gravy: In small bowl, whisk together 1 can broth and flour. Pour vegetables, neck, giblets and drippings in roasting pan through colander set over large bowl; press on solids to release any liquid. Pour drippings into 4-cup liquid measuring cup. Let stand 1 minute or until fat separates from drippings. Skim off and discard fat from drippings. 6. Place roasting pan on stovetop over medium heat until bits in bottom of pan turn deep brown. Add wine and heat to boiling. Boil about 2 minutes or until most liquid evaporates, stirring with whisk to loosen browned bits from bottom of pan. Pour drippings in measuring cup back into roasting pan. With whisk, stir in broth-flour mixture, and remaining 2 cans broth and 1 teaspoon salt; heat to boiling. Reduce heat to low and cook 10 minutes, stirring occasionally. Strain gravy through fine-mesh strainer before serving.